Dark leafy greens grow in abundance during the fall and winter seasons. I’ve written a post here about why it’s important that I feed them to my family especially during the cold and flu season. Filled with minerals, vitamins, and phytonutrients, they are probably the most concentrated source of nutrition out of any food. They are a rich source of iron, calcium, potassium, and magnesium. Their vitamins include vitamins K, C, E, and many of the B vitamins as well. They’re phytonutrients contain beta-carotene, lutein, and zeaxanthin, which protects from cell damage. I enjoy to use all types of greens. We eat swiss chard, kale, radish tops, beet tops, turnip tops, mustard greens, amaranth leaves, sweet potato leaves, spinach, bok/pak choi, and many more varieties. Some are a bit more bitter than others; however, I like to experiment and try new things and honestly…I hate to waste. So, if a vegetable has a top or stems, we make use of them. One of my favorite ways to make use of greens with stems attached is to make naturally pickled leafy greens and stems with onions through the process of fermentation. I chop up any extra leaves and stems that I may have after using what I need for a meal, add them into a glass jar with a bit of onion, and simply cover them with a salty brine. I allow my pickles to sit out at room temperature for at least two weeks, burping them in between that time. The time and salt allows friendly bacteria to work diligently within the brine, and in my opinion, produces the tastiest and crunchiest pickles. During the colder seasons, I enjoy eating this kind of pickle on top of deep, flavorful roasts or stews which brightens them right up. I don’t know what I like best about natural pickles, the taste and flavor or knowing well that by eating fermented foods regularly our immunity is ramped up by promoting the growth of healthy flora throughout our intestine. I like it all. A natural leafy green and onion pickle made with a simple brine cure. It's a perfect way to use up leaves and stems of tender and sweet leafy greens. Any kind of dark leafy green with stems. My favorites are beet tops, swiss chard, and kale. 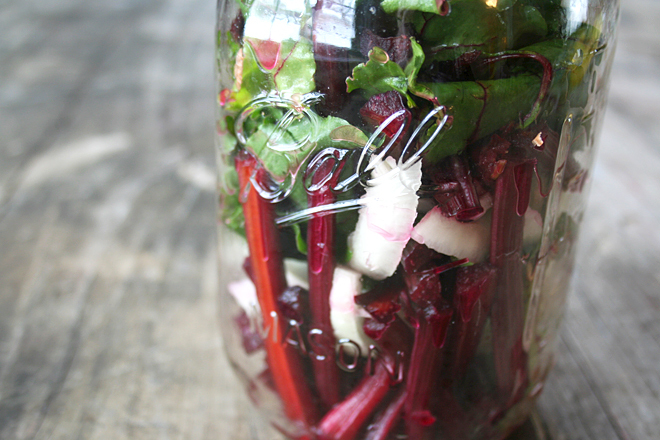 In a quart sized mason jar, layer beet tops, stems, and onions until filled to the top. Fill with filtered water and add 2 tbls large granule salt. Cover and shake to mix the salt throughout. Uncover, and add more filtered water to cover the contents. Store in a cool place for 1 - 2 weeks or until fermented to your liking. Throughout the 2 weeks, make sure to look over the contents and open up the lid to “burp” the jar and release the gasses created. Once fermented, store 3-6 months in the refrigerator. Do you enjoy making natural pickles. Share in the comments below what your favorites pickles to make are. Was wondering if there was a recipe to pickle and seal.. store longer than the 3-6m you have in the fridge.. ? I can them in the hot water to seal.. I was wondering can I use Himalayan Salt in the salt brines or does it have to be kosher? Cigi, yes, that should be no problem!